Blewbury (Bleobyrig) means “Variegated Soil Borough” which refers to the Iron Age Hillfort on Blewburton Hill (Bleobyrig-Don). One legend says there was a battle here that gave it the name “Blood Borough” or Blidberie as the name appears at Domesday (1086). Another story says that the local dead were brought here from miles around. When the pall-bearers arrived at the fort they blew a horn to call everyone to the bury-al. Blewbury Bottom does appear to have been a prehistoric graveyard with many ancient burial mounds, and the early Saxons certainly used the fort for similar purposes. Blewburton was originally the site of a stockaded camp, for local Iron Age people, built in the 5th or 6th century bc. Around 400 bc this was replaced by the banked hillfort of today, surrounding numerous circular huts. Excavation has shown the Western entrance to have had an impressive double wooden gate supporting a walkway above. It also had ten ritually deposited horse skeletons around it! The whole place was destroyed soon after the Roman conquest. Just off the path above the chalk pit near Churn Farm, stands one of these barrows, Churn Knob, also called St. Birinus’ Mound. It was upon this tumulus that the saint was supposed to have first preached to the people of England in AD 634. A large wooden cross erected there commemorates the event. Birinus, Bishop of Genoa, had been sent by Pope Honorius to convert the pagan people of Mercia. He landed at Portchester and moved up through the Christian Celts of Hampshire to Silchester. Before he reached Mercia though, he encountered the pagan Saxons of the Thames Valley. Finding them greatly in need of Christian teaching, he decided to stay and was directed to the King’s estate on the Berkshire Downs, possibly at Cholsey. Here he met King Cynegils of Wessex and it was he who chose Churn Knob as the site for the saint’s first sermon. He must have thought this ancient pagan place to be a fine spot to intimidate the newcomer. However, Birinus was unperturbed and even managed to convert the King to Christianity (See also Brightwell). The mound appears to, in fact, be the remains of two barrows. When excavated it was found to contain a cremation burial and a riveted bronze dagger. The name first appears on record as Churn Hill & Farm in 1761, but may be related to Churden Down recorded as early as 1548. Its origins may lie in some connection with the Celtic God of the Countryside, Cernunnos. Perhaps St. Birinus founded the parish church. It is certainly a Saxon foundation, though the present building mostly dates from the late 12th century. It has a number of interesting brasses, including one Agnes, Lady Daunce, a daughter of one of the Lattons from Upton Manor and the wife of Henry VIII's surveyor general, Sir John Daunce. Their eldest son, William (who appears on the brass), married Sir Thomas More's second daughter, Elizabeth. 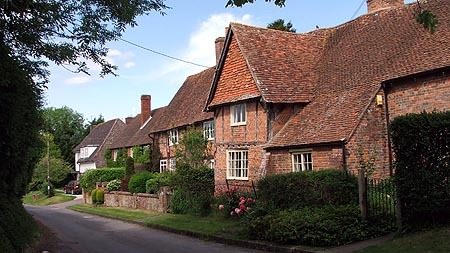 The village of Blewbury was the centre of a large Saxon estate which is shown by 10th century charters to have covered the parishes of Blewbury, Aston Upthorpe, Aston Tirrold, North and South Moreton. The village is well known for its, now unusual, thatched cobb walls said by the locals to be of Saxon origin. The Tudor Hall Barn is said to have been one of Henry VIII’s hunting lodges. In the 1930s an Oath of Allegiance to Oliver Cromwell, signed by John Fuller, was found hidden between two beams at the Barn. For many years the Fuller family have kept an ancient tablecloth and pewter service on which both Cavaliers and Roundheads had dined within half-an-hour of each other. They were both compulsory guests at the Barn after the Second Battle of Newbury (October 1644). The King was retreating to Wallingford and Colonel Waller was hot on his heals. John was probably hedging his bets by keeping his personal documents hidden. Kenneth Grahame lived at Bohams in the parish after retiring from the Bank of England. He later moved to Pangbourne.